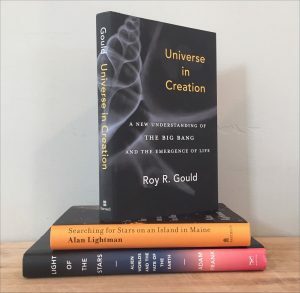 Roy R. Gould’s UNIVERSE IN CREATION: A New Understanding of The Big Bang and the Emergence of Life (Harvard, 2018) overlaps on a couple topics with the Adam Frank book reviewed previously. But. Gould would like to claim that the universe has a ‘story’, a plan in its infrastructure of particles, forces, and rules (laws of nature), and this ‘building plan’ and its consequences suggest the universe is going somewhere; it’s trying to accomplish something (p5.6). Many scientists have pondered such questions; is the universe guaranteed to produce intelligent life? Most have said no; this would be teleological. Or is intelligence necessary as an observer effect in physics? 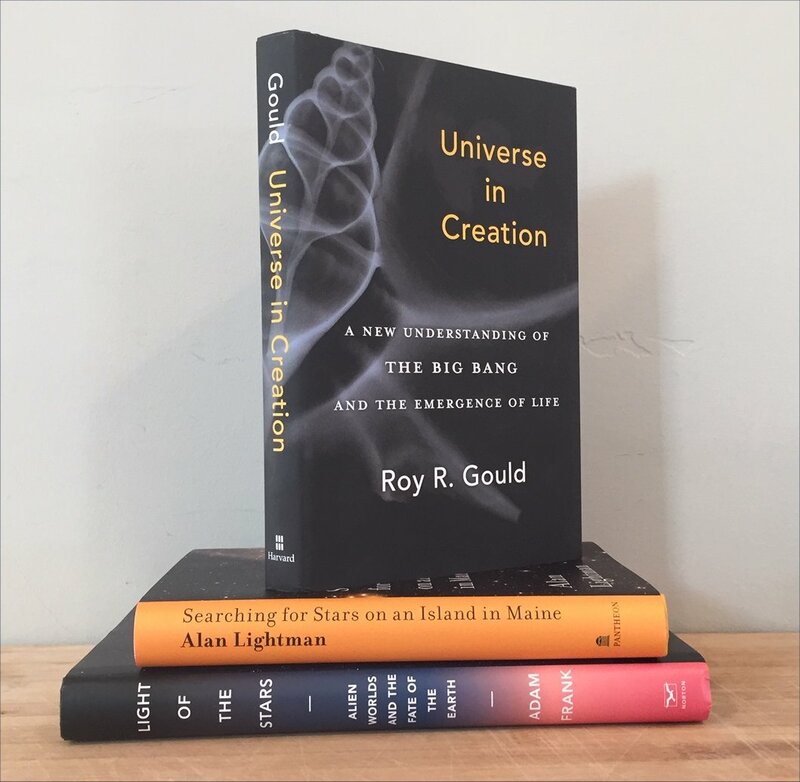 Author takes two approaches: examine the history of the universe to the present; and consider the properties of life especially since we know thousands of extra-solar planets have been discovered. And so author summarizes the history of understanding our local planets, their distances; the galaxy and its extent; the discovery that there are billions of others. The discovery of the expansion. Einstein and relativity and gravity. Dark matter and dark energy. The discovery in 1988 that the expansion is speeding up. The laws of nature; if they were anything else, we wouldn’t be here. The fine-tuning problem. Several possible answers. A brief history of the universe: how stars create elements; the emergence of life. And then the idea that life was built into the universe’s building plan. –And here, in Chapter 11, the book goes off the rails. Where do the ‘applicants’ for evolution comes from? he wonders, and decides “In other words, we evolved a new feature because we needed it” p159. No no no! He ends by claiming the universe “behaves as though it was a purpose” and that we “may” be fundamental to the universe’s existence. The author never makes an argument that there is some reason the universe’s ‘rules’ or laws of nature *have* to be this or that to produce life; he doesn’t even demonstrate how life would inevitably result, which would be a great claim. He continually begs the question by referring to nature’s ‘building plan’ to imply intent, when there’s no reason to think other than we are in the one random universe that happened to have conditions that created life — by an accident that might as well not have happened — compared to others in the multiverse with conditions that would make our complex universe impossible. It’s a book of wishful thinking, and rather dim-witted awe. Repeatedly he contrasts the idea of a ‘building plan’ with the alternative of ‘blind chance’ when neither need to be true; evolution is a continual feedback process to advance things that work and let pass away those that don’t. Not a plan, or random chance. Note p144, where the author comes across as a bit dim. Note also how many of his footnotes are to obscure, and old, references, e.g. books from the ‘50s about some scientist or philosopher who must have made an impression on the author at the time. This persistent misunderstanding of evolution is yet another example of how the world works in ways unlike human intuition. People need things to make sense in terms of story and purpose, and many are inclined to believe, and try to rationalize, what they wish to be true. This entry was posted in Book Notes, Cosmology. Bookmark the permalink.